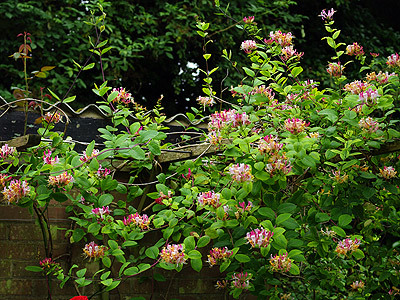 Climbers are incredibly versatile plants. They tend to grow fairly quickly and do their stuff at about our head height. This means that we don't have to bend over to appreciate them. Unlike other plants that are at our head height such as small trees and large shrubs, they don't take up a huge amount of space. 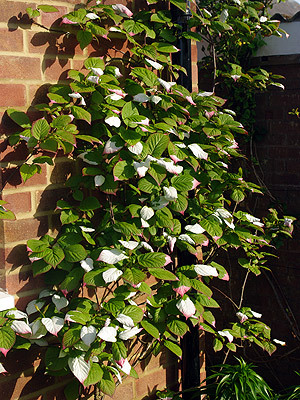 Some of my favourite plants are climbers. 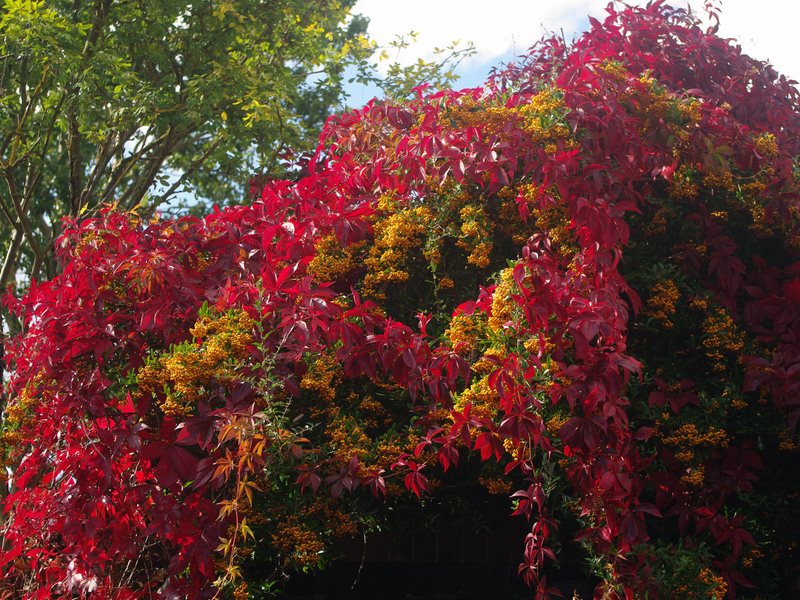 From the delicately beautiful and wonderfully scented flowers of sweet peas to the great masses of flowers on Rosa "Kiftsgate" and giant dinner-plate sized leaves of the aptly named "Crimson Glory Vine" Vitis coignetiae in its autumnal splendour. 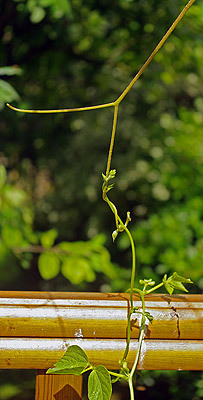 Climbers just seem to be so "planty". 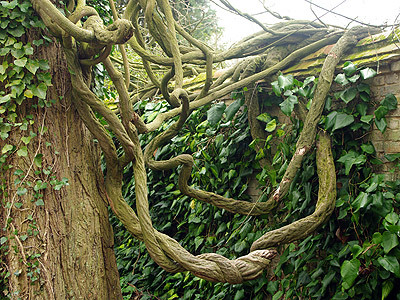 If you think about a lush verdant scene, it usually includes vines and climbers coming down from above. Jungles and lush conservatories look as they do because of all the climbers growing up and hanging down. 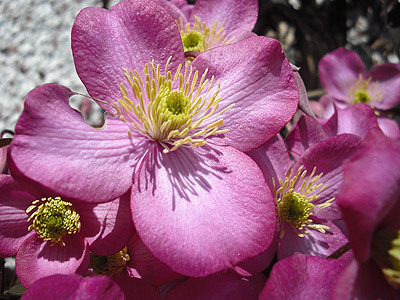 Climbers don't need to put as much energy or effort into support as other types of plants. 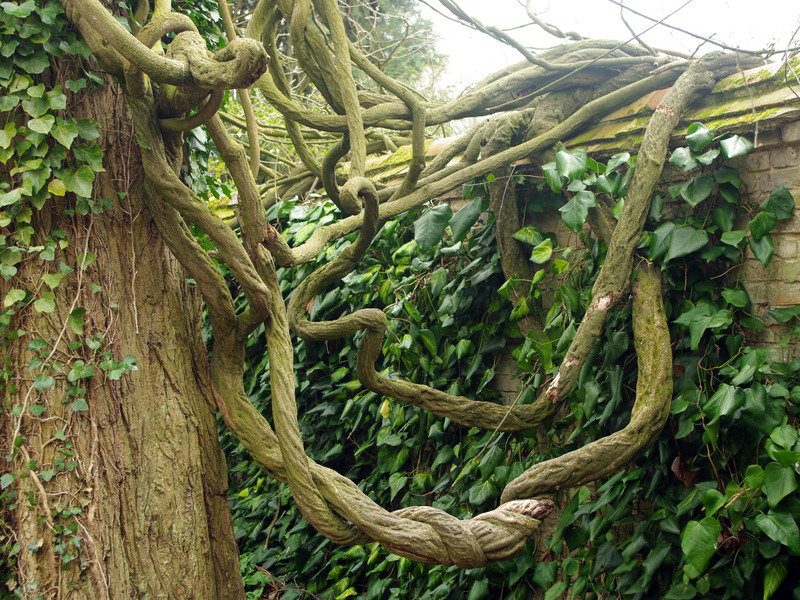 Why make big woody stems and trunks if you can lean on another plant (or trellis / wall / pergola etc.) that has already done it for you? This means that they can grow that much more quickly, produce more leaves more quickly and produce and keep producing flowers and fruit. As a bonus, all this often happens just about at a height where we can appreciate them. If you have a garden you can grow climbers, the trick is in choosing the right ones and growing them in the right way, in particular with the right kind of support. They are fairly easy to manipulate into doing what we want them to do and going where we want them to go. Because they need a support and can't grow without the support, they tend to be very obedient in this respect. Walls and fences are the obvious place to grow climbers but even better is some kind of three dimensional structure such as an arbour or pergola, obelisk, arch or even a tree. Many climbers are the cultivated descendants of wild ancestors that grew either in or on the edge of woodland. They are adapted therefore to grow in three dimensions through trees or shrubs, usually with their roots shaded and moist and their heads in the sun. As I really love climbers, I find it very difficult not to recommend loads of them, I've been strict with myself and so here are some of the best. Some popular favourites, some less well known. 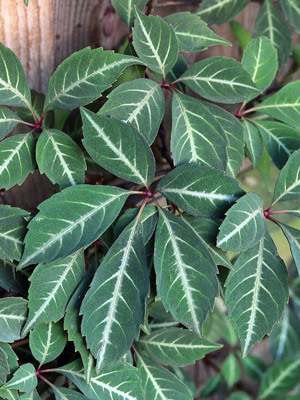 I have all of these in my garden, though just one of the three Parthenocissus species given. Various shades or red, yellow and orange. 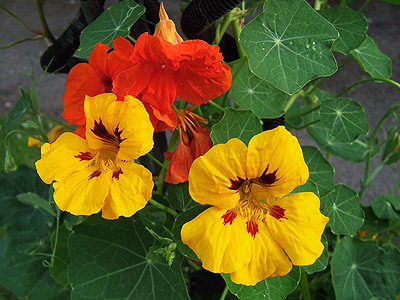 Easy and reliable, dwarf varieties are available which are good in hanging baskets. 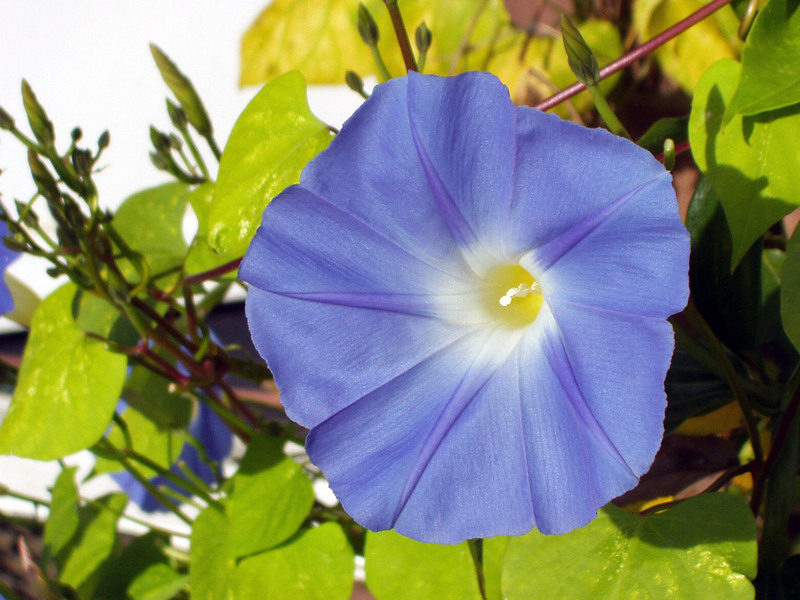 Big seeds and quick germination with lots of large showy flowers make them good for children to sow. Prone to being eaten by cabbage white caterpillars - though when that happens I tell myself I'm now growing butterflies instead of flowers. Nasturtiums have edible flowers, leaves and seeds, they can be used in salads tasting similar to watercress. 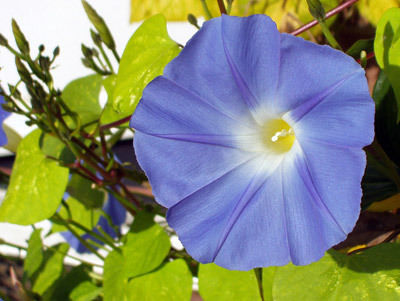 Wonderful bright blue trumpet shaped flowers all summer long that keep on coming as long as you dead-head every day, feed and water well. Also available in other colours, though touches the blue for my money. Sow fairly early in the season indoors or under glass, place supports as soon as they appear. Traditionally these should be sown on St.Patrick's day, March the 17th. If you don't have room in the garden to put them in the ground, grow them in a large container about 45cm in all dimensions using a wigwam of canes 1.2m high within this to support the plants once they begin to grow. Can also be sown in pots with some protection in the autumn, or even straight into the ground in autumn, just remember where you put them and keep the area weed free. Spring flowering clematis, fast growing and rather large plants, need a good big support, will happily scramble through a tree or informal hedge producing an abundance of medium sized flowers. Come in varieties of pink from deep to pale and though to white. A huge choice of named varieties are available in a myriad of shades of blue through purple to red, pinks and white. 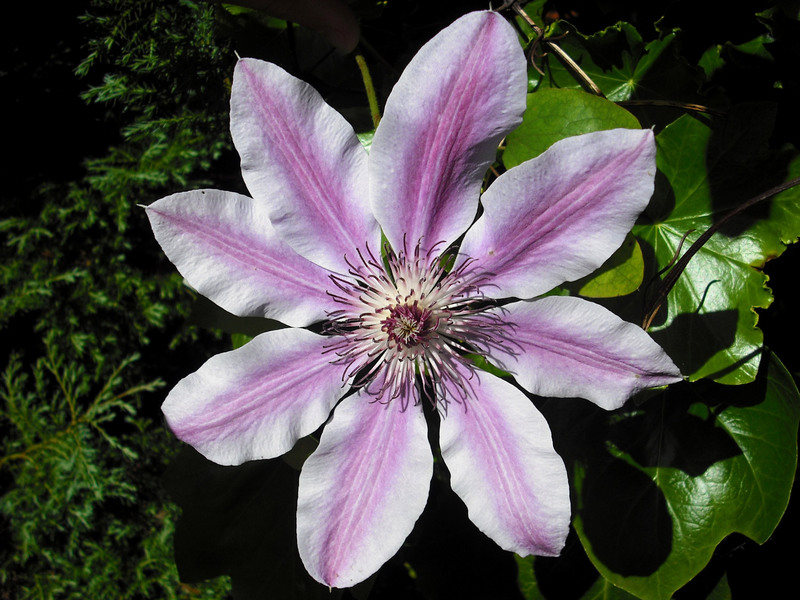 Great velvety petals on flowers frequently 4-6" across. 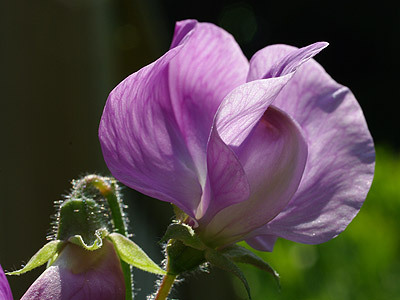 Flower in late spring and often with a second, smaller showing in the autumn. 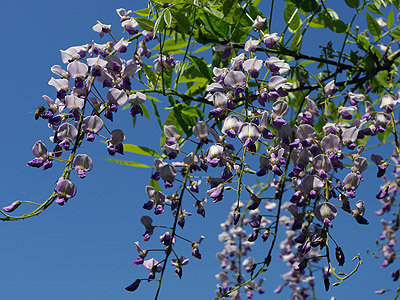 C. x jackmannii, blue / purple large flowers - best grown semi-informally can be confined to a 2-dimensional trellis or wall as long as they have some space to come out from it a little way. Similar in growth habit to C. montana, but flowering in late summer and autumn with small bell-shaped 4 - petalled flowers in all shades of yellow from pale to deep and through to orange depending on variety. Some of the loveliest yellows available are found here. Foliage finely dissected and fern-like, can have a glaucous tinge in some types. Many available varieties "Bill McKenzie" probably the best. The woodbine of the romantic poets. Beautifully scented usually bi or tri coloured flowers borne in great profusion. The ancestors came from woodlnad and they are much better grown in 3 dimensions than two, will happily grow up open trees, over arches and pergolas etc. 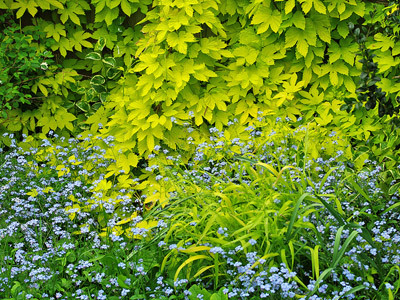 There are both evergreen and deciduous varieties. Probably the most popular self-clinger whose homeland is actually Japan. It clings very closely to its support and, once established, is extremely vigorous. Its autumn colouring is a knockout brilliant magenta. The leaves have a shiny gloss. Needs full sun to power those autumn colours fully. A looser clinger than Boston ivy and may bulge out a little from a wall. 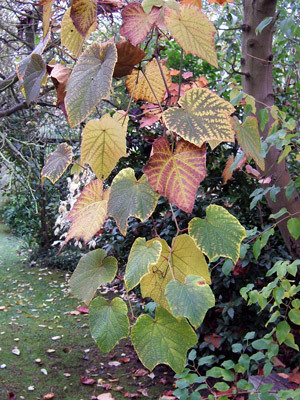 Its foliage is palmate, divided into five leaflets, rather more delicate than Boston ivy and the autumn colour is a warm red, taken on fairly early. Similar to Virginia creeper but of more restrained habit, with smaller leaves. 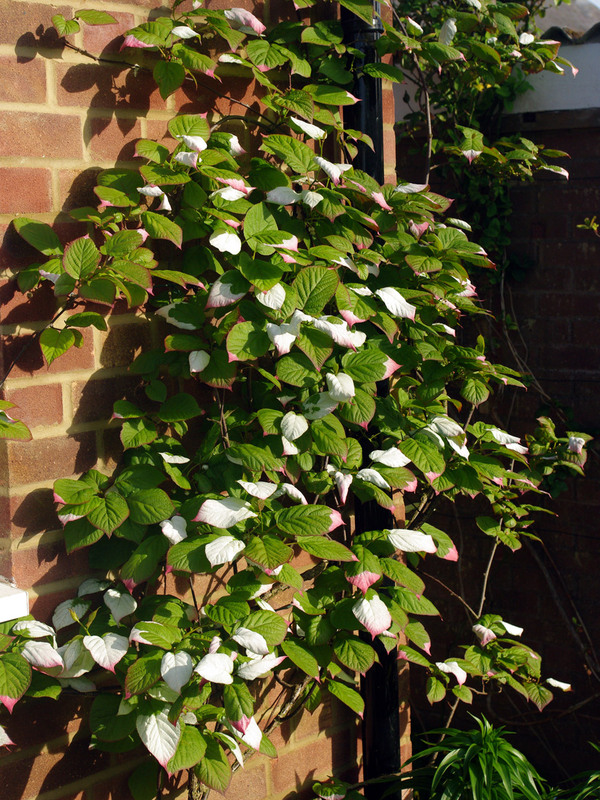 Can be grown on a shady wall, it develops conspicuous paler bands along the main veins. I tend to like big plants more than small ones. 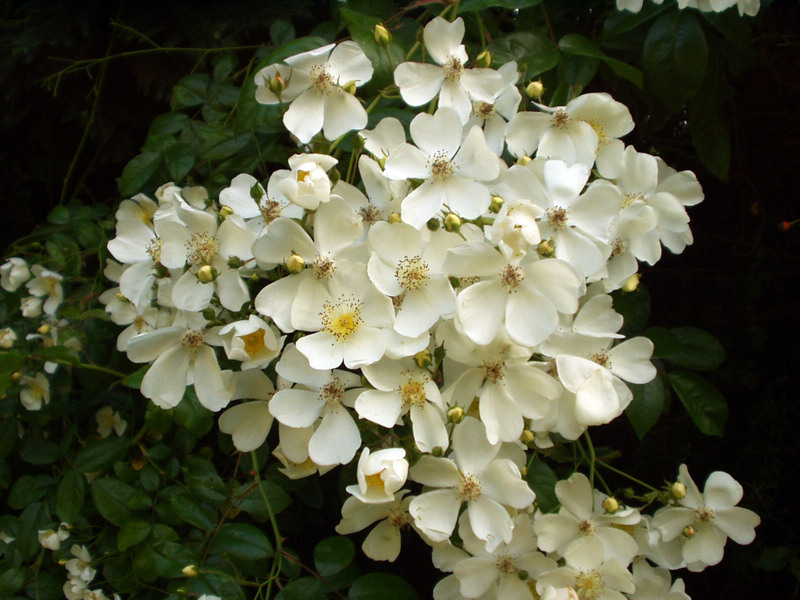 Rosa "Kiftsgate" is a rambling rose that always wanted to be a tree. You need space for this one and a large support. A large open mature tree will do nicely, I've also seen them doing well grown along a long post and rail fence where the length of run has made up for lack of altitude. A wonderful plant, hardy and vigorous with an indecent quantity of large sprays of white scented flowers. A good intruder barrier too, the thorns were rejected by the people who invented barbed wire because they were too brutal (I just made that bit up - but I wouldn't try and climb through it, no matter how drunk). - A scrambler with backwards pointing thorns, needs tying in at first. Arguably the finest of all climbers (no argument as far as I'm concerned). A member of the pea family with great trailing racemes of vivid blue or purple flowers in late spring (white ones are available, though I tend to regard them in the same category as red Delphiniums - why?). They can be quite slow to flower and it's the grafted named varieties that perform best, so dig deep in your pocket when going to buy one. Get a good cultivar and as large as you can afford. They need regular pruning of new growth to keep them flowering rather than just producing leaf. One of my favourite climbers this one, large bright green heavily textured leaves up to 12" across whose autumn colours earn it its common name as they change colour culminating in bright crimson. 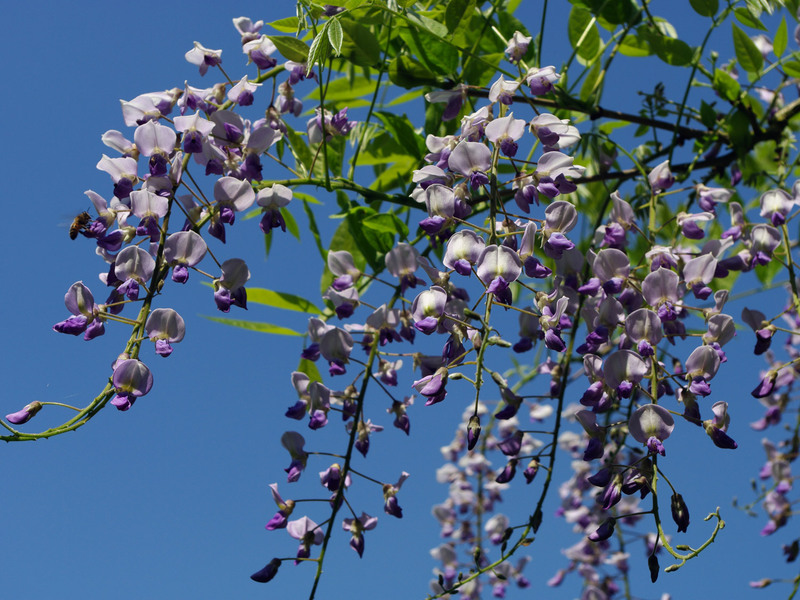 A vigorous and large plant that will grow to 50ft if given space in a mature tree, alternatively grow it up and over a pergola to give summer shade and autumn fireworks. Part of mine grows on a trellis atop the garden fence where it seems quite happy. A not often seen but splendid plant, long lived and quite slow growing for a climber. It's particular trick happens in the summer when the new leaves open and develop white and pink colouration as if the ends have been dipped in paint. There are insignificant flowers too, but the leaves really steal the show It takes a while for the leaves to start to show their colouration in the spring so don't expect much from the first 2 or 3 years, the show gets more pronounced as the plant gets older. 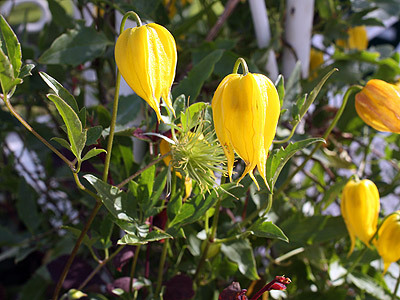 A very hardy plant, though shoots can be hit by frosts, give it some protection if possible. 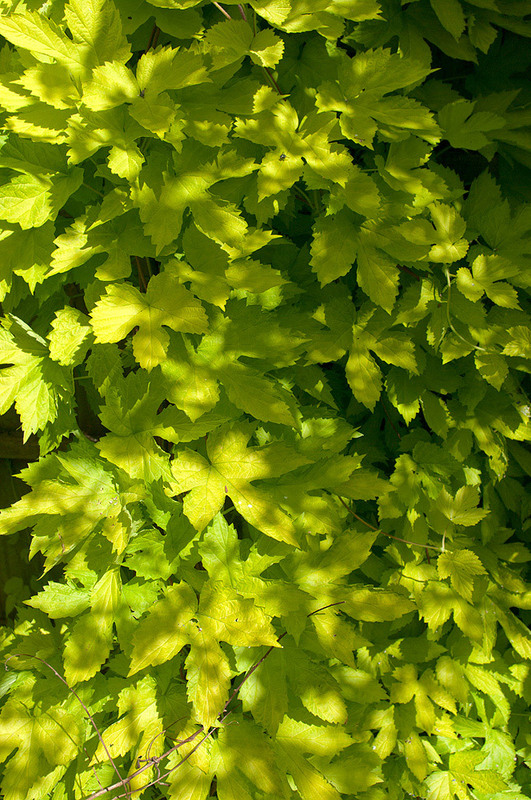 A large and vigorous climber that is a relative of the hops used to brew beer. It is somewhat unusual amongst perennial climbers in the garden in that it dies down completely in the autumn and produces new shoots from ground level each year, this ensures that it doesn't get too out of hand despite its fast growth rate. Lovely bright yellow/green foliage that is lighter the more sun it gets, if grown in more shaded conditions it will be a darker green colour. It provides a the perfect backdrop for a whole range of other plants, particularly the blues of forget-me-nots and Ceanothus, also good with the white flower heads of Spirea.